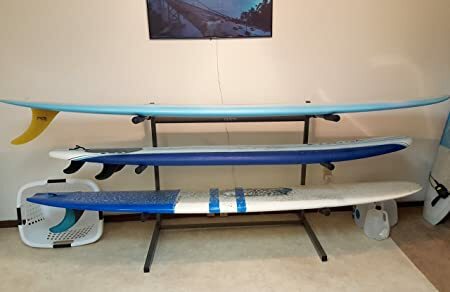 Are you in the market for a surfboard rack—somewhere you can store and possibly even display your surfboard when it is not in use? If so, the following article may prove very helpful. Here we have reviewed several of the best surfboard racks currently on the market, and highlighted the pros and cons associated with each rack. We have also included a Surfboard Rack Storage Buying Guide, in which we will discuss the various factors and features you should consider when setting out to purchase a surfboard storage solution. Quick Answer: What are the best indoor storage racks for surfboards in 2018 – 2019? 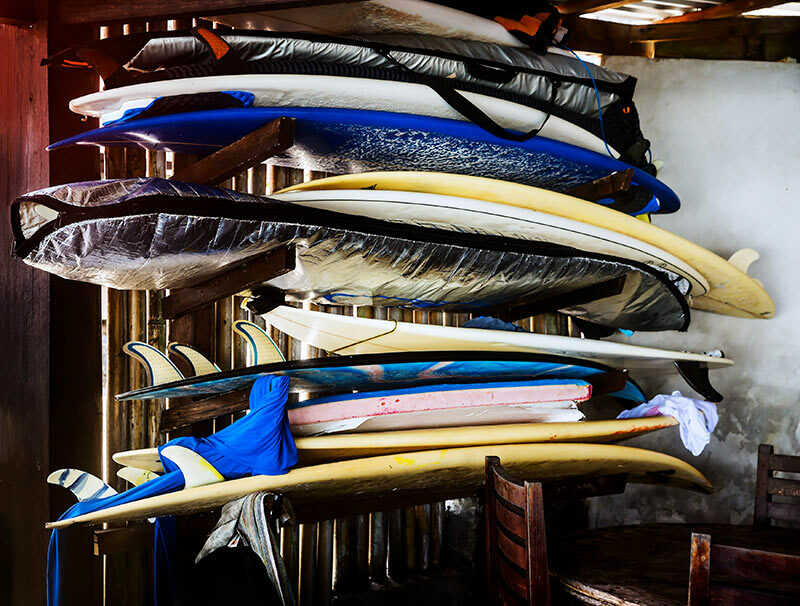 How Many Surfboards Are You Storing? Surfing is a great sport. However, when the summer is over you will definitely need a place to store your surfboard in the off-season so that it is protected from damage. This is where are good surfboard rack can come in very handy. Surfboard storage racks are available in a variety of types and sizes. To help you get just the right rack to suit your needs, below we will discuss some of the factors and features you should consider when buying one of these items. Surfboard storage racks come in many different types and shapes. Home surfboard racks can essentially be broken up into two main categories: Vertical surfboard storage racks and horizontal surfboard storage racks. Vertical surfboard racks are for mounting surfboards on the wall. This wall could be in a storage area such as a garage or in any room of your home. Vertical storage racks in the home are ideal for those who want to showcase a special or meaningful surfboard. Horizontal surfboard racks are more for storage and are usually mounted in a garage or other storage location. Of course, when you hear the word surfboard rack it can also refer to those racks placed on different types of vehicles, such as those made for automobiles and bicycles. Automobile surfboard racks are usually mounted to the top of a vehicle where the boards are kept in place by a secure strap and lock system. Bicycle surfboard racks can be mounted to the side of a bicycle or in the back, allowing even pedalers to travel with the board. Bicycle surfboard racks are a very common sight in beachside communities with a strong surfing presence. The size and weight capacity of your surfboard storage rack should depend on the size and weight of your surfboard. Be sure to measure and weigh your surfboard from tip to tip before heading out to make a purchase, and read the description very carefully to ensure it can handle a board of your size. How many surfboards do you need to store? There are currently on the market storage solutions for every type of situation. Some surfboard storage racks can accommodate two or multiple boards at the same time. In addition to surfboards, this includes wakeboards, and stand up paddle boards as well. Just be sure that you don’t overload the rack because not only can it break, but you will end up damaging your boards. Surfboard storage racks can be constructed out of a variety of materials, each of which has its advantages and drawbacks. Some of the materials from which these surfboard storage racks are made include aluminum, stainless steel and even wood. Aluminum is a lightweight metal that is easy to lift and position. It can also help guard against rust and corrosion, making it one of the perfect materials for a surfboard storage rack in seaside areas, where the air is filled with salt and other potentially harmful deposits. Stainless steel surfboard storage racks, especially those that are powder coated, are perhaps the most durable types of racks and they are also corrosion resistant. However, surfboard storage racks made from this material tend to be very heavy and can be difficult for one person to maneuver and mount. Moreover, the mounting hardware is more apt to work loose with a heavier material like stainless steel. 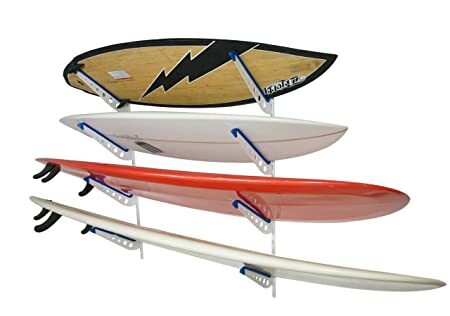 Wooden surfboard storage racks, especially those made from lightweight wood sources like balsa, are not only ease to hang and install, they also offer great aesthetic value to any room, allowing you to showcase your surfboard or paddle board with pride as part of an overall beach-related décor. Just be prepared to spend a little more with a decorative rack made from wood. If you are going to spend a lot of money on a high-quality surfboard storage rack you definitely want to make sure that all of the correct mounting hardware is included and comes standard with your purchase. The last thing you want to do is bring your surfboard storage rack solution home just to discover that the mounting hardware with which to hang it was not part of the purchase. Last but not least, does the surfboard storage solution you are considering have a money-back guarantee? If it doesn’t, it definitely should. An extended warranty is typically representative of the confidence a given manufacturer or company has in their product. Therefore, those products that do not offer a warranty or any assurances should probably be passed on by. The StoreYourBoard Wall Rack is the perfect solution for storing your surfboard or stand-up paddle board. Made from tough stainless steel tubing, this surfboard rack helps to resist corrosion and can hold all styles of surfboards and SUPs, including long boards, racing boards, touring boards and inflatable styles. You will never have to worry about scratches or dings with this unique storage solution, as the thick foam-padded arms help to protect your boards regardless of your storage area. From a structural perspective, the rack’s solid steel frame and oversized foam padded arms make it amazingly strong, yet very gentle on your board. In terms of fit, there is a generous 12″ of space between the arms on the rack, which gives you ample room for even paddleboards with big fins. Additionally, the arms of the rack are 27″ long to hold long-style surfboards and stand up paddle boards up to 40″wide. The StoreYourBoard Wall Rack is perfect for displaying your cherished surfboard or SUP and adds great aesthetic value to any den, game room, man cave or office. The rack is available in two sizes—the dual-arm rack for storing two boards; and the tri-decked rack for holding up to three boards of various sizes…the perfect rack for a family of surfers or paddle boarders. Another really great feature about this rack is that the arms are completely removable. This means they can be quickly detached and stowed away when your rack is not in use – leaving you more space for other things you need to store. The rack has been treated in a multi-stage rust prevention process and then powder coated black to provide an attractive and rust resistant finish. Strong. The tough steel tubing of the StoreYourBoard Wall Rack makes it very strong and durable. Rust resistant. Treated with a rust resistant coating and then powder coated for aesthetic value, this rack will last a lifetime. Removable arms. The removable arms will give you more wall space with the StoreYourBoard Wall Rack when one or more of your boards are in use. Heavy. A few reviewers have complained that the StoreYourBoard Wall Rack is a bit heavy to manage during the mounting process. The Stoneman Sports Storage Rack and Display Stand is a freestanding storage solution that rests directly on the floor, without any need for mounting or mounting hardware. A very large and roomy rack, the stand has enough room for 3 stand-up style surfboards or paddle boards, making it ideal for those users who own more than one board. The Stoneman Sports Storage Rack and Display Stand boasts a heavy-duty and very durable steel frame, which is able to accommodate boards up to 40 pounds on each rack level for a total of 120 pounds. Because it is freestanding, the Stoneman Sports Storage Rack and Display Stand is very portable. It can be used anywhere you normally store your boards—a game room, garage, deck or even your office. The removable arms can be assembled and disassembled with just a click of a push pin, giving the rack an amazing level of maneuverability and flexibility. This unit lets you store boards flat or on an angle and because it features removable arms it is a terrific space saving device when your boards are in use. Heavy Duty. The Stoneman Sports Storage Rack and Display Stand is made from heavy duty steel, so heavy that it accommodate three surfboards or paddle boards with a combined weight of 120 pounds. Easy remove arms. Whether you need the stand to hold two or three boards, the easy-to-manipulate arms make it easier than ever. Multiple positions. With the Stoneman Sports Storage Rack and Display Stand you can display multiple boards either flat or an angle. Not made for just one board. The rack is designed for two or three boards, but is not a good display option for a single surfboard. 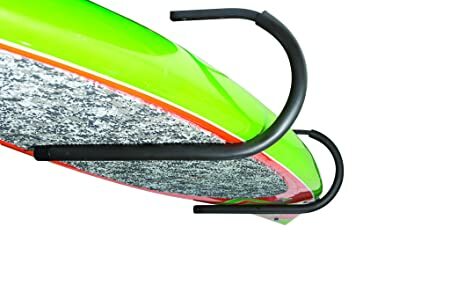 The brand new Cor Surf Stand up Surfboard Wall or Ceiling Rack features a bigger and stronger design than the company’s original model, making it one of the best-selling surfboard racks on the market today. The rack boasts a 190 degree bend that helps it account for any sagging when storing two heavy boards with the device; and its strong construction translates to a rack that can be used both indoors and out. Made entirely from sturdy galvanized steel and powder coated black for a great aesthetic look and feel, the unit is rust and scratch resistant. The stand’s simple design allows for easy and quick installation, and all the mounting hardware you need is included in your purchase. Rust resistant. Made from powder coated steel, the Cor Surf Stand up Surfboard Wall or Ceiling Rack is completely corrosion resistant. Easy installation. The one-piece simple design of this rack makes it super easy to install. Lifetime Warranty. The lifetime warranty on the Cor Surf Stand up Surfboard Wall or Ceiling Rack demonstrates the manufacture’s utmost confidence in this product. Reports of missing hardware. A rare few owners have complained that the surfboard rack arrived without the proper mounting hardware. To give you a quick recap and easy comparison, check out our favorite surfboard storage racks in the chart below. You’ll find more options from your favorite surf retailer, but the Squad stands behind these models at some of the best indoor surfboard storage racks for the money.